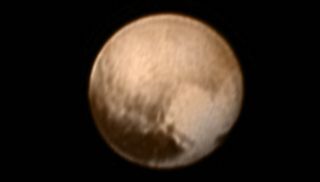 A large heart-shaped feature on Pluto is visible in this image taken by NASA's New Horizons spacecraft on July 7, 2015. NASA's New Horizons probe captured amazing images of Pluto, scientists revealed details about a proposed superpowerful space telescope and NASA announced its first four commercial-crew astronauts. Here are Space.com's top stories of the week. Could Mars life be supported by atmospheric moisture? A space telescope 25 times sharper than Hubble?